Kaori Uesugi is originally from Tsubame City, Niigata and her current record label is Teichiku Entertainment. She made her debut from BMG JAPAN (now “Ariola Japan”）with a single “Kaze” released on 6/21/1995. Her stable singing style and charming smiles on stage attracted many enthusiastic supporters. 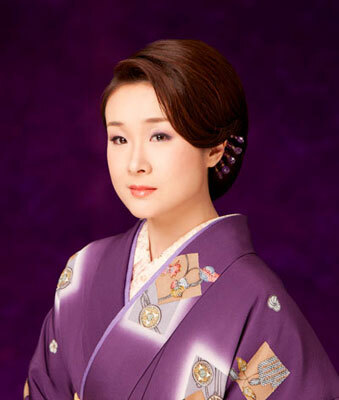 As BMG JAPAN’s enka division was officially closed, she changed her record label to Teichiku Entertainment where she released her new single “Nonbee” in 1999. From April 2000 to March 2003, she was hosting a radio program “Hashire! Kayokyoku” as a member of “G-pan Musume” with Hiromi Kashima and Ryuko Mizuta and became extremely famous. Uesugi is currently in a unit named “Rainbow Usagi-gumi” with other Teichiku artists, Miyuki Nagai and Hiromi Yamaguchi, who were also born in the year of rabbit(=usagi). For the release of “Onna Zake” on 2/15/2006, she wore the national Japanese uniform for the Olympics instead of her usual kimono and made headlines in various media at the time. “Onna Zake” became a huge hit with the sales of more than 200,000 CDs.